Part of the EAW community has set up a development group here. If you would like to help out to make EAW even better, please contact me via a PM. High I signed on to test the new EAW. Life intervened unfortunately, but I am back on it. I remember getting it to run on Windows 7 a few years ago, but I have forgotten how to do it. I checked around the internet and I am not having any luck. I thought there was a little program that you added to run it with. I could be mistaking it for another older program. My second question is: The download you gave me had the 1.28 and a 1.40 version. On the web i see a few yesrs ago you had posted a 1.50. Am I supposed to stay with the 1.40? There are two EAW groups. This one supports 1.29, and SimHQ 1.50. The reason for the split is simply 1.50 has no simple back compatibility, where 1.29 does. 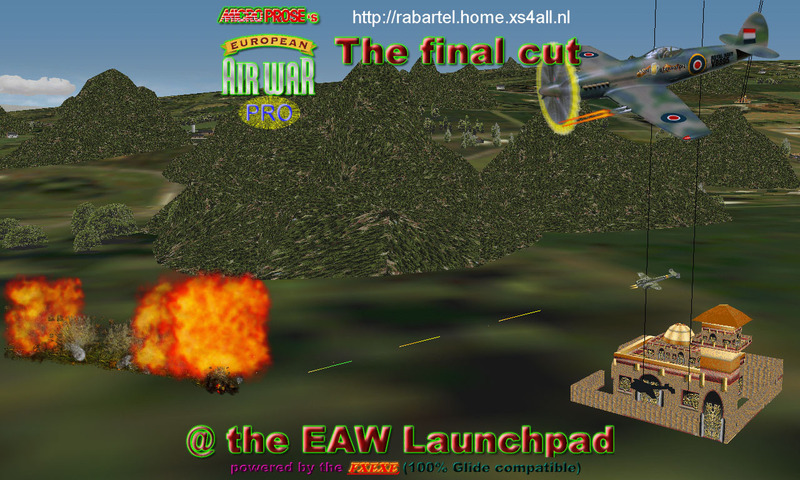 I supports EAW 1.29.exe, Drop in and Play Technology. Just download and install Nglide, then unzip EAW 1.29, open the game and open Game Set Up, set Graphics to Glide. Install any downloads in the root folder or use a file handler like OAW, of Skins N' More, both available on Sandbaggers. I have tried to run both versions of the new EAW and I always get a CTD. I have tried a different array of compatibility modes and also downloaded the runtime file on MEDIA files. I am running windows 7 home premium. I have an I7 Intel chip (older). I have 16gig of ram and a newer radeon card. I know that I have gotten an older version of EAW to run within the last two years, but I cannot remember how. I have also been searching through the SimHQ and other places for a fix. I do not have EAW installed on the C: drive in program files. Could this be the problem? EAW also runs on Linux with Wine Software. Try the "stock" version of EAW of v1.2 to see if you can get it to run. It runs on Win7 and Win10 in D3D mode, and Glide mode with Zeuses nGlide. Open all day ,no membership required, professional help or just a chat. And you can also have a look at my latest creations or just visit our screenshot gallery to get an impression of our games! Just leave a message and I'll get back to you ASAP.